Energy has soared into 2019 as the best-performing sector so far this year, a stark contrast to last year when it was the worst sector in the market. The gains have been led by the rebound oil prices, which after a precipitous drop from highs have just posted their best win streak since July 2017. 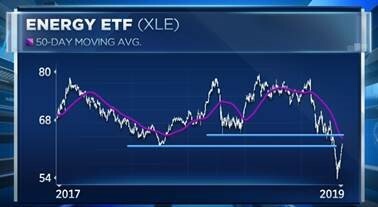 The XLE exchange-traded fund, which tracks the energy space has soared nearly 16 percent off the December market lows. However, Bill Baruch, president of Blue Line Futures, warns investors looking to play the broader energy space that it might be too little too late. "Trading it is one thing but if you're going to buy this as an investment right here you can't let FOMO [fear of missing out] kind of take over," he said Wednesday on CNBC's "Trading Nation." Despite the recent surge the XLE is still down 20 percent from its October highs and Baruch said there could be resistance ahead. "Where I'm looking at is a retracement from the highs and the 50-day moving average that come in the mid-63s area. So we've got to get a close above there," he said. Stacey Gilbert, head of derivative strategy at Susquehanna, also offers caution over owning the entire energy space, however she remains optimistic on individual names in the group. "Our analysts have both highlighted [that] you have to focus on the good balance sheets, particularly those with free cash flow growth here," she explained. In particular, Gilbert highlights names in the oil services space like Schlumberger and Halliburton. Both are lagging the broader move in the energy sector, but are up double-digits off those December lows. "Investors continue to basically maintain that upside positioning in both names," she said. Additionally, Gilbert likes oil exploration company Pioneer Natural Resources, with the firm targeting a 30 percent move higher from its current levels. "We certainly think there continues to be attractive options in the energy space and the options market would agree with us," she said.